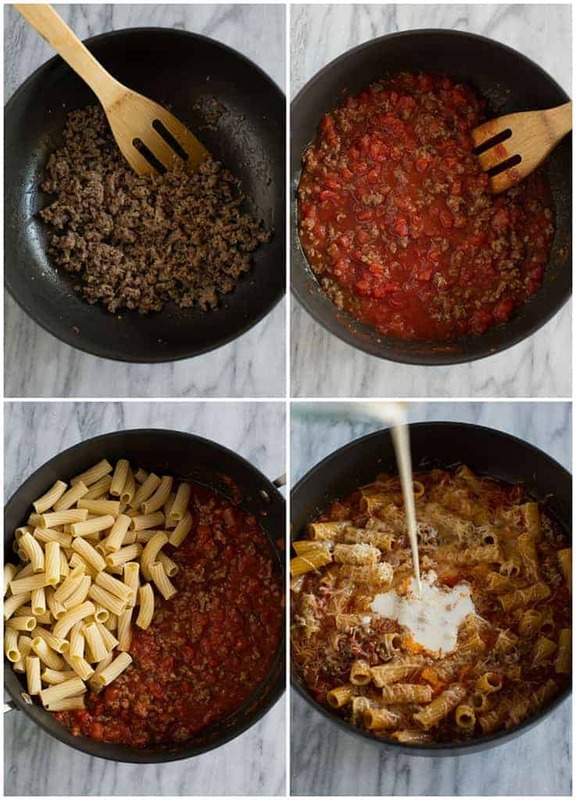 My family LOVES this easy and delicious Baked Ziti recipe, and I love that it’s made all in just one pan! It’s as fast and delicious as comfort food gets and ready in less than 30 minutes! If you haven’t noticed by now, I’m a huge fan of quick and easy homemade dinners. A lot of people associate homemade or “from scratch” cooking as being time consuming or too much work, but that’s an attitude I want to squash with my blog. I make easy homemade dinners for my family almost every night because they are just that–EASY! Everything tastes better homemade! I don’t spend hours slaving away in the kitchen, and I’m in control of what goes in the dish. I have tons of easy meals on the blog, like this Creamy Chicken and Asparagus Pasta, Thai Basil Chicken, or Creamy Tomato and Spinach Tortellini that all take less than 30 minutes to make. Don’t miss these 30-Minute Meals! 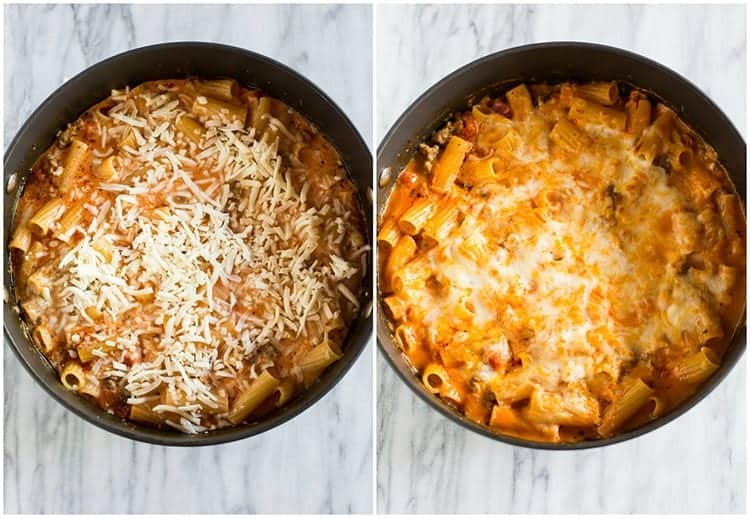 One Pan meals are appealing to everyone because the entire meal is made using just one pan! 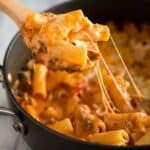 This One Pan Baked Ziti accomplishes my goal of an easy homemade dinner– only using one pan from start to finish! It’s these type of meals that qualify you as rock-star mom status in my book 🙂 It’s cheesy, sauce-y and totally delicious! You can make it in any type of LARGE skillet, as long as it’s oven proof. A simple cast-iron skillet would work great. If you can’t find ziti noodles at the store, buy them online, or substitute penne, farfalle, or other type of bite-size pasta. First brown the ground sausage, red bell pepper, and garlic in a skillet. Add the diced tomatoes, tomato sauce, basil, and oregano. Simmer for about 10 minutes and then add the water and pasta. Bring the mixture to a boil and cook for about 15 minutes. Stir in the half and half and parmesan cheese. Top the dish with a generous sprinkle of mozzarella and bake at 500 degrees until the the cheese bubbly and golden. Allow the baked ziti to cool for a few minutes before serving. Can I make Baked Ziti ahead of time? Baked ziti is best made fresh. If you want to make it ahead of time, follow the directions up to step 4. Don’t add and cook the noodles yet because you don’t want them to get soggy or to soak up too much of the liquid. Continue with step 5 just before you want to serve it. What goes with baked ziti? I like to serve baked ziti with a warm vegetable or a big green salad. You could try these roasted vegetables or this wedge salad recipe. Enjoy! 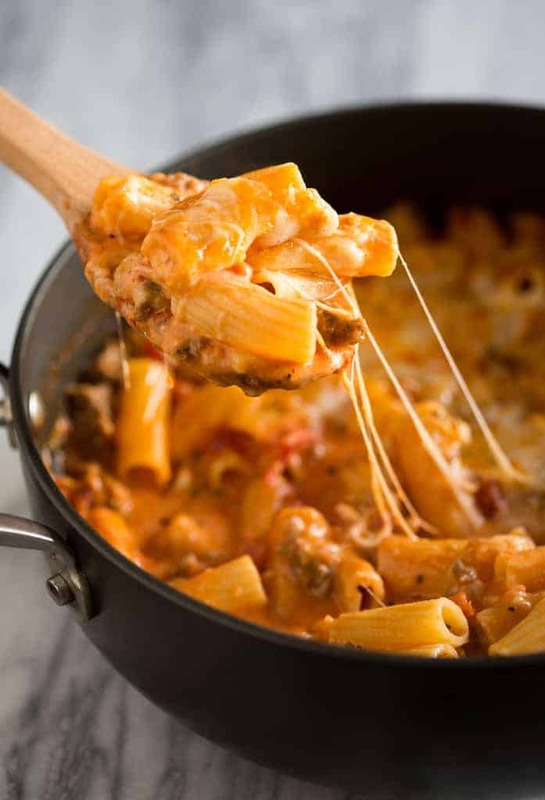 My family LOVES this easy, simple One Pan Baked Ziti recipe. It's as fast and delicious as comfort food gets and ready in less than 30 minutes! Add olive oil to a deep, 12-inch or larger oven-safe skillet over medium heat. Add sausage cook until browned, about 3-5 minutes. Add the garlic and crushed red pepper flakes to the pan and cook for 1-2 minutes. Add the diced tomatoes, tomato sauce, dried basil and oregano. Stir well. Reduce heat and simmer, stirring occasionally, for 5-10 minutes. Add the water and dry pasta. Bring to a boil, cover, reduce heat to a low boil and cook, stirring occasionally, for 10-15 minutes or until noodles are tender. Stir in the half and half, and parmesan cheese and season with salt and pepper to taste. Sprinkle mozzarella evenly on top. Transfer the skillet to the oven and bake until the cheese has melted and browned, about 5 minutes. Enjoy! I love to serve this with easy Homemade Breadsticks! *I originally shared this recipe February 2015. Updated November 2018. Made this last night and it was excellent! I portioned off a small amount of the sauce to make a smaller batch with gluten-free noodles and that also turned out great. One of my all time favorites! Simple yet delicious. My family loves it. Hi, can this be finished on the stove rather than oven? Know the cheese will not brown. However, not sure if my pan will tolerate a 500 oven! Yes, of course–the oven if just to brown the cheese.